Chocolate City Group and Sheraton Lagos Hotel presents A Night With Femi Kuti – an exclusive evening of live and exhilarating afrobeat music headlined by the legendary Femi Kuti. The event which is open to only a select number of guests will feature the afrobeat master performing music off his latest album One People One World and other classics such as Beng Beng Beng, Shoki, Sorry Sorry, etc. 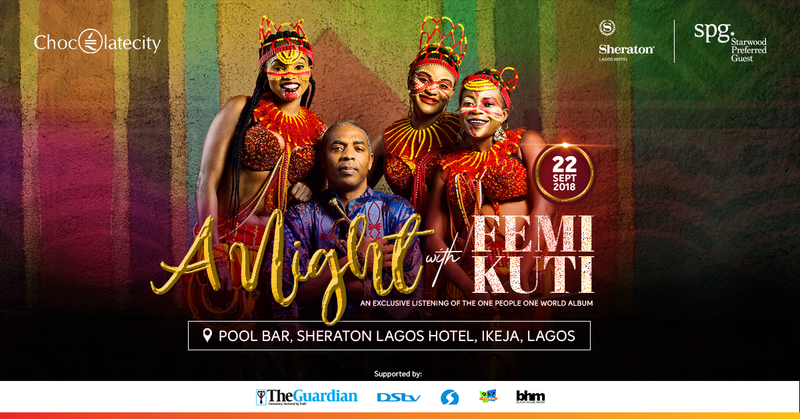 A Night With Femi Kuti will take place at the Pool Bar, Sheraton Lagos Hotel on the 22nd of September 2018 from 6pm.